Vortex has greatly improved the quality of my life, and now I have a solution whenever my benign positional vertigo flares up. I’ve had BPPV off and on for over 30 years. Like many, I tried going to different doctors, had many tests done, and tried various treatments. However, it was not until I made an appointment w/ Diron that I finally found someone who really knows how to fix vertigo problems. He also educated me about my condition and that helps too. I feel like I have my life back now. I can go on a roller coaster again, and I can snorkel the next time I go to Hawaii! Why Choose Us for Your Rehabilitation? Vortex Physical Therapy & Balance is one of the few physical therapy clinics in California to exclusively focus on the treatment of vestibular disorders, neurological conditions, and balance issues. As such, we are the local specialists in the treatment of vertigo, dizziness and balance-related conditions. Our therapists have advanced training and specialization in vestibular rehabilitation therapy (VRT), as well as neurological and geriatric treatment. We work with each of our clients to provide personalized treatment plans using the latest techniques and advances in the management of vestibular disorders. When scheduling, you will be assigned to work with one of our physical therapists throughout your treatment program – from evaluation to graduation. Studies have shown that working with the same therapist provides a better continuity of care and ultimately, better results. Our clinic is outfitted with high-tech equipment to assist with the evaluation and rehabilitation of vestibular and balance disorders. During the evaluation process, your therapist will put you on the Smart BalanceMaster for Sensory Organization Testing (SOT). 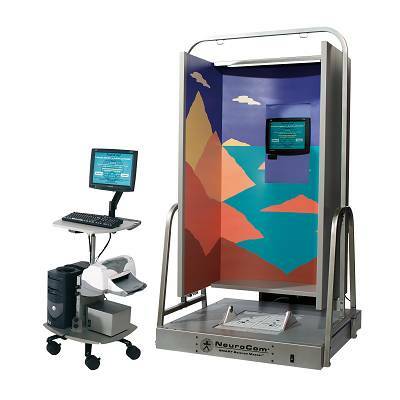 SMART Balance Master® by Neurocom – Our clinic is one of a handful of locations in the Bay Area to use this device in the evaluation and treatment of vestibular and balance disorders. Sensory Organization Testing (SOT) evaluates your three balance sensory inputs: vestibular, proprioception (or joint perception), and vision. These inputs relay information about your environment to your brain. If one is not working effectively, it will affect your ability to maintain your balance. Your therapist will review your results with you to identify any deficits or functional impairments. The test results are used to create a customized plan of care to address your needs. Infrared goggles— While being assessed for BPPV, your therapist may ask you to wear a set of infrared goggles to record your eye movements. The therapist will be looking for nystagmus, or repetitive, uncontrollable eye movements which help determine which ear is affected and which of the three inner ear canals requires treatment. Please note: in most cases, the nystagmus is identifiable with the naked eye and does not require goggles. They are an aid we use when we need extra help in identifying and treating BPPV.